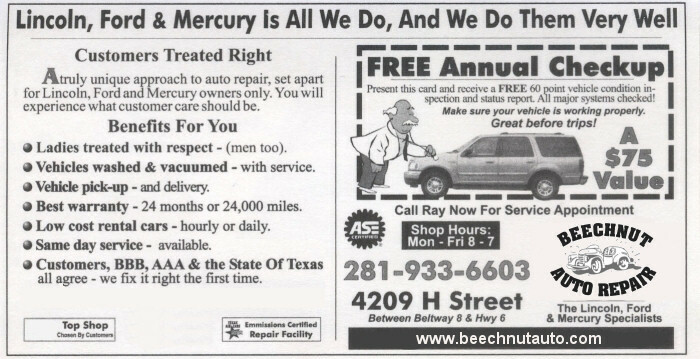 "Let The Lincoln / Ford / Mercury Experts Do It Right The First Time"
Beechnut Auto Repair, the Ford Doctors, in Houston, Texas has a truly unique approach to auto repair, set apart for Lincoln, Ford, and Mercury owners only! You will experience what customer care should be in an auto repair facility. There are no surprises... All prices for automobile maintenance and repair must be approved by you before the work is done. I just moved to Houston, so knowing nothing about auto repair to begin with and without any trusted recommendations I had to rely on the internet. I have a 2001 Ford Explorer with over 150,000 miles on it that my mom was scheduled to drive across the country to my dad. I wouldn't trust this car for a day trip to Austin! There was a constant loud noise coming from the front of the car and it drove like it was an off road monster truck! My father is very particular about who services his vehicles so of course he insisted on talking to Ray the owner who answered all of his specific questions and confirmed what I had already been told. Ford Doctors provided me with a thorough list of all the services performed and recommended, along with the corresponding price so that I was completely aware of what I was paying for. They were even more than happy to humor my dad and let a trusted "auto savvy" friend of his come out and cross check the list before we gave our final approval. Ford Doctors wasn't cheap, but the prices weren't ridiculous either. I truly believe that you get what you pay for and after Ford Doctors inspected and serviced the Explorer it drove better than ever! It hasn't performed this well since I first had the car in 2003! I have had the vehicle checked several times and they failed to notice or solve the problem of the horrible noise coming from the front. The wheels were completely off balance! After my taking my car to Ford Doctors my mind was put to ease when my mother confirmed the pleasant ride upon arrival. Zero problems! In this case I can definitely say that I put my own mother in the hands of the Ford Doctors! Just wanted you to know I was very impressed with the condition of my car when I picked it up. It shows a little more pride in your work when your customer picks up a clean vehicle. I also got a kick out of the fact I had a new key-chain. As Matress Mac would say, "Worklike hell and advertise, advertise, advertise". Smart idea. At this time the air blows cold, cold, cold!! Hope it stays that way. I will give you a call in a week or so and get that battery harness replaced. Once again, the clean car really impressed me, and I am quite satisfied with the quality of your service -- you take care and God Bless!! I have never written a review online before but I felt I had to write one for Beechnut Auto/Ford Doctors. I am still relatively new to Houston, and when I needed a mechanic I searched online and found Ford Doctors. I had to have the car towed in to Ray's cause it wasn't running. Ray called me to let me know what was wrong with the car, how long it would take to repair and how much it would cost. He wouldn't tell me over the phone when I called to ask him about fixing the car, because he wanted to see it first. I have found Ray to be honest, knowledgeable, and fair. He took the time to explain everything that was wrong with the car and explained what it would cost to fix, and if it was something that needed to be addressed immediately or if it could wait. He didn't take the most expensive ways to fix the problem, but tried to go with the best, but also the most economical way to do the repair. I have no concerns about having my car fixed at Ray's shop because I know the repairs will be done and done right, the first time!!! I would highly recommend Ford Doctor to anyone needing their vehicle repaired. I'm considering buying another car, and when I do, I'm going to look at buying a Ford, just so I don't have to look for another mechanic. I don't think there are many as HONEST and FAIR as Ray out there!!!! I have been going to Ray’s shop from the day I purchased my 2001 Mercury Mountaineer. I was impressed by the fact that Ray is not only is a member of the Better Business Bureau, he is an active board member. In addition, Ray has a wellness plan for his customers that includes a variety of inspections and maintenance for a flat fee which is reduced since he can do a number of things at the same time while the car is disassembled. He does wash and vac the car as well as test drives it as part of the service. I have brought the car in for other issues such as an oil leak. Ray attempts to utilize the manufacturer’s or extended warranties whenever possible. Being a woman, I am always a little apprehensive about car repairs since women often get “taken”; however, Ray explains what he is going todo, how and how much. If you let him, he will take you for a tour of your car while it is up on the lift pointing out any problems he has encountered, how he intends to fix them, and most importantly, what he thinks it will cost if all goes as planned. Since maintenance is a big issue for Ray, he keeps our cars running well before major problems occur and he keeps up with the latest research/recalls on our vehicles. Ford Doctors is great! I initially thought the price was high until I compared what you are actually getting. Ray does TOP QUALITY workmanship with TOP QUALITY parts. Some of the jobs take slightly longer than book because HE DOES THEM RIGHT the 1st time. He puts the love & caring of a craftsman into his work. He only works with Lincoln, Ford and Mercury because he is so demanding of quality workmanship and reliability. If you want garbage work, & the resulting ongoing problems associated with it, go to a national chain or some fly by night place. But if you want great auto work done with good faith & a passion to give GOOD VALUE, see Ray at Beechnut Auto/Ford Doctors. He has worked on my F150, always with great results. I stand by him 100%. Remember, in life you may not get what you pay for, but you will always pay for what you get. Using Beechnut Auto/Ford Doctors just makes good sense. And my name you can look up on the Internet, I don't hide MY identity. very satisfied with level of service! I found the reviews I have read here quite interesting. I have had my vehicle repaired many times by Ray at this facility. My experience with him on phone calls about my vehicle have ALWAYS been quite different from other repair shops. While I have asked for an idea of what a given repair would cost, Ray has never given me a "quote by phone". He has told me what the cost of a given part might be, but has followed with an explanation that they would have to see the vehicle and diagnose it to give me exact figures. I have learned that we get what we pay for when it comes to vehicle repairs. Just repairing or replacing a failed part does not mean that the cause of the failed part has been repaired. Making sure that a repeat failure does not occur requires detailed dignostics and competent people to make the repairs. As for price, I once paid a dealership $50 to repair a problem, only to find out that the only part replaced was a $2 fuse! In the end, it is not the cost of the fuse that was important, it was knowing which fuse to replace and where to find it. This company's warranty is better than any dealership I have ever dealt with and Ray has always been very honest in his dealings with me. I depend on my vehicle everyday and trust Ray to keep it dependable!